Now, Abagail Sweater is another story. I think this was the most useful knit ever. It fit her for a looooong time (see? that's a week ago. And she started wearing it at six weeks.) It's cute enough to jazz up the simplest outfit when it's laundry day and all the clothes I like have been peed on. And it's fairly multi-seasonal--she didn't wear it much in the Summer, but she didn't wear much of anything period in the Summer. It's also really comfy. Many of the knits I've put Willow in have been tugged at while she looks at me pleadingly--"Why must I wear this? It's buggin' me." But I get no backtalk about Abagail. It doesn't choke her, it doesn't drag behind her, it doesn't fall off at the shoulders, and it doesn't flap about too much. Plus, it looks really good on her. What size did you make that served your little one for so long. 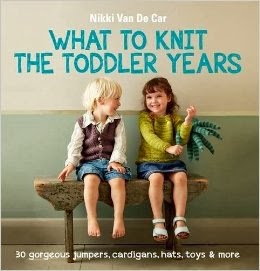 I want to knit something for friend at work and this sounds like a great idea. Thanks! I kind of fudged around--the pattern leaves a lot of room for invention. I used a size 8 needle and Rowan Calmer (which is a terrific baby yarn, I have to say). That's very cute - but how is it different to the February Baby Sweater with the sleeves left off? There's no credit given to Elizabeth Zimmermann in the pattern as far as I can see. Yeah, I noticed that too. It's not that different, in that I'm sure you could just make February Baby and it would come out essentially the same--I've never made February Baby, and I have the sense that she just saw it and wanted to do something using the same stitch patterns--it doesn't have the signature yarnovers around the bottom of the yoke, for instance. Hmmm, I have copyright issues - especially seeing as she's added her own copyright to it! I've made a few FBSs and just finished a FLS so I saw the similarity straight away. Regardless, it is gorgeous. 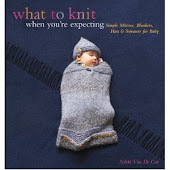 I'm trying to find a good baby sweater pattern at the moment, and we don't know whether we're having a boy or a girl (due in April, which is autumn in Australia). I've done one FBS and want to try a little top-down V-neck cardigan (I'd use Barbara Walker's method but I have no idea what measurements to use for a baby! ).